The first time I had a sushi burrito was in Kauai at this little hole in the wall place on the side of the road called Sushi Girl! I loooooved it and now enjoy making them at home! You can make all sorts of flavor combos. I posted a video on YouTube to break down how simple it is to make it and posted below the recipe if you want to make some sushi burritos at your place! Also, you'll find an epic vegan miso wasabi dipping sauce recipe that my husband made! Make Your favorite sushi rice. We cook 2 tbsp sake into the rice and put in 4 tbsp rice vinegar after rice is cooked. Layer a soy or nori sheet flat. Scoop on about 1 cup rice. Wet your fingers and spread rice evenly across the nori sheet filling in empty spots. Top with a couple strips of sweet potato cucumber, carrot, avocado, red cabbage, cilantro, fudakaki, and wasabi miso mayo (optional). Roll the soy or nori sheet away from you, tucking in all of the toppings. Add an extra sheet to the bottom to make big fatty burritos. Just wet the edge a bit to seal the sheets and roll with a bamboo mat if you have or some wax paper. To store for later, wrap in foil or wax paper (with a little twine) and store in the fridge! Great go on the go or bringing to school or work! I hope that you like it! Let me know if you get your sushi burrito on by tagging me on @earthyandy or in the comments! We are going to make a new video every Wednesday so if you have any requests we would love to here! Talk soon! Oooh do I love potatoes! They are so gentle on the system and warm and comforting and so so simple! Here is a baked fries recipe! And don't forget that simply steamed or baked potatoes are wonderful too! (I really enjoy coconut butter or some organic vegan butter with a little Himalayan salt). You can get fancy but I always go back to this and pair with or on a massive leafy greens salad- like pop corn bowl size of salad. Also note- I personally find benefit in limiting my oils but do enjoy a high quality olive oil orcold pressed flax seed oil drizzled as a salad dressing. 2. Boil water with a steamer while preheating oven to 400 degrees F.
3. Steam potatoes until almost cooked but still firm when poking with a fork. 4. Drain water and drizzle potatoes with himalayan salt and a dash of lemon pepper and garlic seasoning. 5. Cook in the oven for 20 minutes, turning over midway for even crisping. 6. When fries look finished remove and serve with homemade ketchup or serve onside a big salad! SIMPLY SALAD- In France they serve big simple leafy green salads in many restaurants and I just love the simplicity of it sometimes! The trick is to get good fresh produce. Butter lettuce is really nice! sometimes I like to use a spray of olive oil or cold pressed flax seed oil with Himalayan salt. - fresh herbs, shallots, green onion, purple onion, some berries , crushed nuts, purple cabbage, saurkraut, shaved carrots are a simple way to spruce it up! 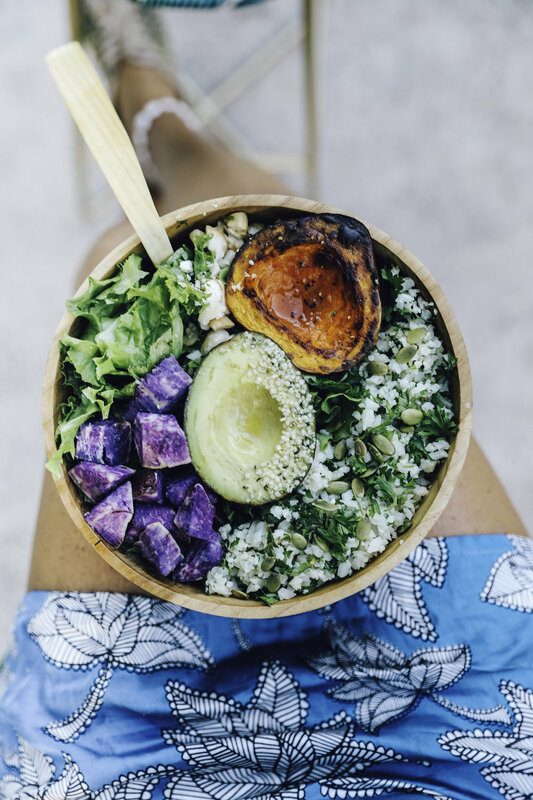 Hydrate and replenish your inner mermaid with this wholesomely stacked bowl of earthy greens, Okinawan sweet potatoes. dried cranberries, crushed pistachios , sour kraut, purple cabbage dinansour kale, blueberries and a drizzle of your favorite sweet dressing! My favorite way to mix up a salad is place a plate on top and shake it all up with a dressing! Adding some avocado with take this over the top! Hope ya like it!! This tastes super good with a lilikoi vinaigrette, or a balsamic vinaigrette OR one of our go-to's for a no oil homemade salad dressing. Combine 1/3 cup your choice yellow or stone-ground mustard with 1/4 cup raw apple cider vinegar, 1/2 teaspoon your choice sweetener ex maple syrup, 1 teaspoon black pepper and 2 tablespoons water. Blend in a small blender and drizzle onto your salad. Store in refridgerator in an air tight container! Hi! I can't believe I have never shared this salad before. It is one of my favs! Its a classic salad but done healthy style! I know I post a lot of smoothies and fruits but greens and potatoes, soups and meals are also a big part of a plant based diet too which I looove! If I am being perfectly honest the only reason I don't post more meals is because by the end of the day my camera happy radar is put on the back burner and getting meals done and homework done and just playing with my kids is my night time whirl! But I am working on a cook book! And have been writing down all the meal recipes once and for all! :) There are so many amazing accounts and recipes out these days! Its amazing to see the creativity and love people are putting into health food! Health food should never be a sacrifice! It should be exciting and flavorful and it seems thats popping up more and more which is awesome!! Speaking of flavor bursts lets get into this salad! This one is so fun! The dressing you make for it (Linked below) can be made and stored in the fridge and used for all sorts of things! I will show you how to make it a dip or transform to a dressing and can be used on most anything like Tacos, a veggie dip, in pitas, on potatoes, salads.. roasted veggies...etc. Recipe below! TORTILLA STRIPS: In a small pan turn to high heat and crisp both side of corn tortilla. 30 seconds to 1 minute or until golden. Remove and place on towel to let cool. Cut into thin strips. CORN: Use a pan and place on high over the stove. After shucking the corn place directly on to the pan. Let the corn blacken slightly on all sides. You can cut the corn in half lengthy wise or run a knife from top to bottom to take the corn off. AVOCADOS: Slice open avocados and cut slices 1/2 inch thick lengthwise. Place on a plate flat and squeeze a full lime even on all the pieces. Season with salt and pepper. Heat grill (if you don't have a grill a pan can work) to high. Place avocados gently onto the grill make, cook on both sides for 15-30 seconds (longer for electric grills). Once avocados are done they will have nice blackened grill marks. Once done remove from grill and chop avocados into 1/2 inch cubes. Drizzle salad dressing over top, mix up and ENJOY! Soups are one of my most favorite dishes not just because they are satisfying and delicious but also because they are cost effective, simple, can feed a crowd, make for great left overs and they are healthful! A few years ago when I was pregnant with Ira we were living in France and I got really into cooking. My neighbor was a chef at a near by restaurant and he taught me a few of his secrets to wonderful soups. The number one tip he gave was to never boil your soups. Instead cook them on low to medium heat for a longer period of time. This saves nutrients AND flavor. It takes a little longer but the end results will be worth it! (Also, many of times, soups are better the next day after the flavors have time to mix). And the second most valuable tip is add fresh herbs and citruses very last to preserve their freshness and vibrant taste. I personally do not like to use no oil and little to no salt in my cooking. I also love bold flavors and believe that healthy food at any means should not equal boring or bland! So when you first start sauteing you onions, add a tablespoon of water in place of oil- easy! I promise you you wont miss it. I will make another post for cream substitutes etc. You can really make any soup that you love into a healthier and vegan option with the right know hows. If this interests you let me know and Ill share everything that works awesome! Okay! Here are 6 soups! Feel free to add whatever you like! I also make a tonne extra to freeze or have throughout the week! I usually add more garlic and lemon than I list but I like a lot! I grew up on this soup! I love it! 1) In a large soup pot put a tablespoon of water and add onions, garlic, carrots, potato, and celery. Saute until vegetables are almost tender. 2) Add the diced tomatoes with juice, bay leaves, parsley, lentils and the stock. 4) add fresh parsley and dill at the very end for most flavor and freshness! *NOTE an easy way to clean leeks is discard outter tough layer, slice down the middle, and immerse in a bowl of cold water. 1 cup cooked pasta ( I prefer corn quinoa based pastas for best texture and keeping it gluten free. In small amount of water add onion, garlic. When onions are translucent add celery, carrot, diced tomatoes, broth, yams, potatoes, green beans, oregano, sage, chili pwd, salt, pepper. Cook 15 min on simmer. Stir in garbanzo beans, parsley, basil ,cayenne pepper, pasta. Cook on simmer 10 min! In a large pot, bring water to a boil. Add the carrots and lentils and let boil for 10 min. Then add the rest of the vegetables (except for the potatoes), the soup bases and spices. Let simmer for 20 minutes then add the potatoes, crushed tomatoes, and mushrooms (and black pepper to taste if desired). Simmer for 20 minutes or until the potatoes are cooked through. Heat 1 tablespoon of water in a large soup pot. Saute carrot and leek over medium heat for three minutes, could be longer . I have done it for 10 min. It makes no difference in the taste. Add yam. Cover and cook for 2 mins. Add ginger, pepper, nutmeg, salt, and water or broth. Bring to a simmer. Reduce heat to low and simmer for 20 mins or till vegs are soft. Cool down before pureeing it. These recipes are all very simple, quick and flexible with ratios of ingredients. Be creative and try different ingredientsto see what you like best. They are great meals or bases to elaborate from.